We would like to invite you to our upcoming Annual General Meeting, open to all members and non-members to attend. The Branch is seeking nominations for steward and officer positions, so please put yourself forward. 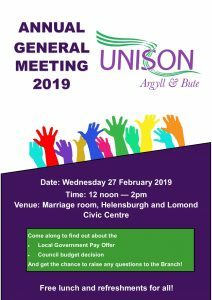 Nominations forms are available on our website at: http://www.unisonabc.org.uk/nomination-forms/ or contacting our Branch Secretary at maryfwatt@virginmedia.com or 0758590384. Please return these by Thursday 21 February 2019. Lunch and refreshments will be available, please RSVP at maryfwatt@virginmedia.com so we know you’re coming along. For those who cannot attend, please contact us if you would like to submit any motions.